Greg Long Big Wave World Tour Champion 2012-2013, Excellent video, covering a wide variety in Venue. 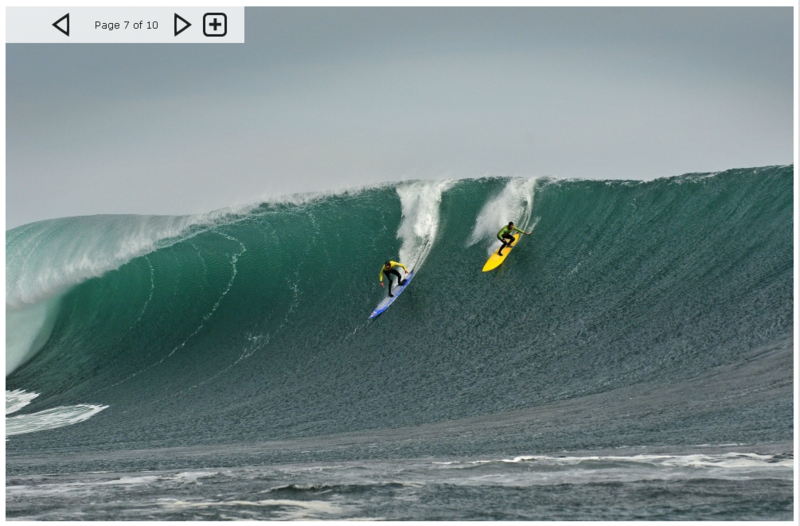 Chile to Mavericks, to Nelscot Reef Oregon and More. Quiksilver Ceremonial Punta de Lobos 2011 from VIA DE ESCAPE on Vimeo. Today (Saturday around 12:00 PM) at Lori Wilson Park, they had a contest and the waves were nice even with the fairly strong onshore winds. Size was solid waist to stomach high with maybe some bigger sets. Fairly long workable shoulders for longboarders and some nice sections for shortboarders. Friday nite in Satellite Beach they were waist to stomach high with high onshore winds but really good form around 5:30 Pm for longboard, marginal rides for short board. Quiksilver Ceremonial Punta de Lobos 2011contest, from magicseaweed.com, the first contest on the big wave tour event. Sunday morning, it should be solid waist high plus in Cocoa Beach and further south. At 6 Pm Saturday night it was around 4 feet at 8 seconds at the 120 mile buoy, and between 11 and 12 today it climbed up to 7.5 feet at 8 seconds, so at least its still a solid wind swell. Oh yeah, the winds should be NW at first light and turning NNW for an hour or so and N to NE sometime between 9 and 10 Am. Oh, high tide is around 5 Am Sunday morn, and as ya’ll know High going low is always better than low going high. So get out by 6:30 to 7:30 and ya got perfect tides and good winds. I forgot, ya’ll know about my obsession with big wave surfing events, the video here is Chile, Brazil’s Marcos Monteiro took top honours in the season’s first Big Wave World Tour event at the Quiksilver Ceremonial Punta De Lobos Big Wave Invitational in 30ft plus surf. Many of the big name big wave surfers were there. The list of the full cast of the 2011 Quiksilver Ceremonial were: Jamie Sterling, Kohl Christensen, Grant Washburn, Carlos Burle, Marcos Monteiro, Peter Mel, Ben Wilkerson, Cristian Merello, Greg Long (won the Eddie against Kelly Slater), Gabriel Villaran, Frank Solomon, Nic Lamb, Joao De Macedo, Eric Rebiere, Sebastian De Romana, Rusty Long, Felipe Cesarano, Andres Flores, Ramon Navarro, Diego Medina, Fernando Zegers, Reinaldo “Chacha” Ibarra, Matias Lopez, and Leon Vicuna. Anyhow, have a great sesh Sunday, and stop by the The 10th Annual Waterman’s Challenge, June 11-12, 2011 contest at Lori Wilson or actually International Palms Resort to show support which starts at 9:00 Am I believe Sunday morning for day two.